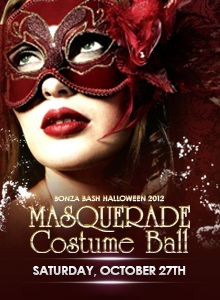 The hottest event in fall is back - welcome to the 5th Annual Bonza Bash Masquerade and Costume Ball! Join us at Seattle’s most premier waterfront venue – Bell Harbor. Be prepared to partake in and witness the biggest and best Halloween costume contest in the city. Dress in either Classic Masquerade (Black Tie + mask) or Delicious Costume, the choice is yours. Support a fantastic local non-profit: O'Christmas Trees, is Providence Senior and Community Services’ premier annual fundraising event. Monies raised from our costume contest support a mix of health care, hospice, senior and supportive housing programs for those in need. Visit www.providenceochristmastrees.org for more details on the cause. Movin 92.5s DJ Marty Mar and C89.5s DJ Lifeguard will be igniting the dance floor with the hottest mix you have heard all year! Another Bonza Bash staple, included in the price of your ticket!